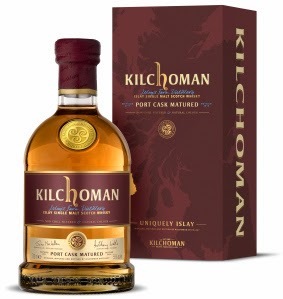 Kilchoman Distillery has today announced the release of their first port cask matured whisky. Kilchoman Port Cask Matured (55% ABV) is the first port matured bottling from this now highly renowned farm based distillery on Islay’s west coast, that was established in 2005. Distilled in 2011 and fully matured in ex Ruby Port casks, allowing for the full influence of the port casks to be imparted into the whisky, this latest release is mahogany in colour with a touch of ruby. The nose is powerful with lemon and citrus notes - The palate has smoke right away along with a sweet, nutty milk chocolate character. Limited to 6000 bottles, Kilchoman Port Cask Matured will be available from the end of August through specialist retailers for a RRP of £68.